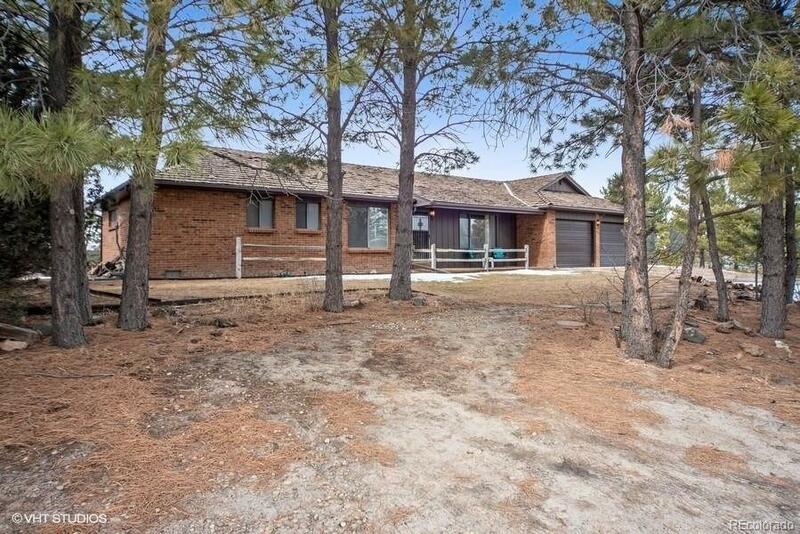 Delight in towering pines nestled around this 3 bedroom, 2 bathroom ranch-style home, situated on 5.4 gently sloping acres! This charming home offers a formal living rm with a large picture window, a study or bedrm with open shelves, a cozy kitchen with a dining area, and a spacious family rm featuring a stone accented fireplace, floor to ceiling windows, a built-in bookcase, a dry bar & refrigerator, and sliding patio doors leading to a lovely covered patio. The generous master bedrm also offers sliding patio doors to the covered patio, and a private en-suite bathroom. Additional features include: another bedroom, a full bathroom, a laundry room w/stackable washer & dryer, a brick exterior, an over-sized 2 car garage w/workshop area & crawl space access, and a private backyard. The wonderful Bannockburn neighborhood allows horses, alpacas & donkeys up to a total of 5, and up to 10 chickens. Enjoy easy commute to schools and Elizabeth, & only 15 mins to Castle Rock & 20 mins to Parker!